The major protein subunit of the amyloid fibril in Alzheimer’s disease is a small molecule of 42 residues (termed A4). It is derived from a larger precursor (PreA4), the gene for which is located on chromosome 21, in close proximity to the region involved in Down’s syndrome. The predicted structure of PreA4 suggests that it is an integral membrane glycoprotein. 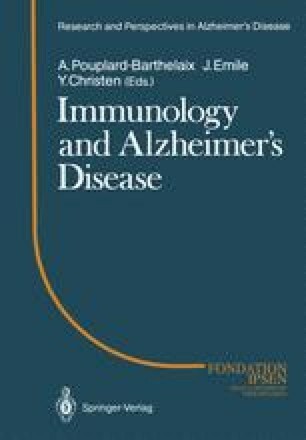 Knowledge of the mechanisms by which PreA4 is degraded to A4 may contribute to a better understanding of the cause of Alzheimer’s disease. Similarly, the amyloid fibril in the unconventional virus diseases is composed of the PrP molecule, which in turn is derived from a neuronal membrane glycoprotein. An understanding of the process by which the PrP molecule is converted into an amyloidogenic molecule may shed some light on the nature of the infectious unit.